Knowing the right way to feed your betta is fundamental, because not doing it right can have big consequences on your bettas health. Nothing is more stressful than dealing with a sick fish, right? So, let's do it right, and get rid from the calamity! Here are some golden rules on feeding your betta. First, select the proper food. Bettas are selective eaters. 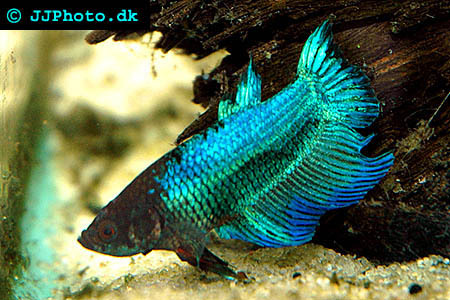 A betta specific pellet is ok, but live and frozen foods are preferable. The recommended diet includes frozen brine shrimp and frozen bloodworms. The next rule is to not overfeed your Bettas. Carefully dose the meals, because even if the fish ate all you give him, he will produce so much more waist when overfed and the pollution level of the jar he is in will go beyond safe range, this problem is smaller if you keep your betta in a larger aquarium. Remember not to leave uneaten food in the Aquarium! Once your betta and rest of the fish is done eating, you must remove all uneaten left over food. If you do not remove it, it will punctually rot and cause havoc in the tank. Bettas prefer to eat from the upper parts of the water column. They don’t really enjoy eating from the bottom of the tank. So before dropping the food in the tank, make sure you have his attention. Let him see the food, get it close to his face from the outside of the aquarium, let him check out what it is, and then there you go! Drop food in front of his nose. The best way is to drop a tiny bit of food--about 6 frozen brine shrimp, watch the bettas eat it all and then look at the belly, if it looks the same as it did before you fed, it’s ok to give them more, but always watch and make sure to make the second portion smaller than the first. Your betta should go for the food right away, but if not, watch where the food sinks, and what the betta does. If more than 15 min he has not eaten the food yet, remove the food. Never let the water go cloudy. If it is already, then change it, as cloudy water will threaten your betta’s health. Normally, small bowls or containers should be changed at least twice a week. Larger tank can be changed once a week. And notice if the ammonia and nitrite levels are up the roof, because both are very bad for your Betta. Also be wary of harmful bacteria they can ruin your fish life, but don’t kill of all bacteria in the aquarium since a lot of bacteria is essential for a well functioning aquarium. During the pre-spawning period you can feed a wide variety of food, including blackworms, Grindal worms, fruit flies, brine shrimp, mosquito larvae and frozen blood worms (all are life except the frozen blood worms). During this period the adult fish may be fed 4 times per day or more depending on how close the fish are to being placed into the spawning tank. You can start feeding your betta fry, 5 days after the spawning. Feed the fry several times per day, using a variety of foods (infusoria, boiled egg yolk, baby brine shrimp…) made up of small particles.